Announcement These beautiful malas are handmade with love and prayer from semi-precious stones, seeds & woods! I make these high quality mala prayer beads with awareness of the healing properties of stones and string them on strong, flexible beading cord, then make all the tassels. Wrist malas are strung on strong, clear stretch cord and last and last. Anglican rosaries made to special order! These beautiful malas are handmade with love and prayer from semi-precious stones, seeds & woods! I make these high quality mala prayer beads with awareness of the healing properties of stones and string them on strong, flexible beading cord, then make all the tassels. Wrist malas are strung on strong, clear stretch cord and last and last. Anglican rosaries made to special order! Making malas at my jeweler's bench. Inspiration comes from many cultures - here, Africa. 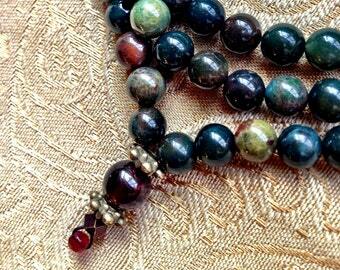 Playing with combinations of beads...Quan Yin and antique African beads. One way to hold a mala during mantra use...close to the heart. A handful of mixed tone amethyst...I love amethyst! 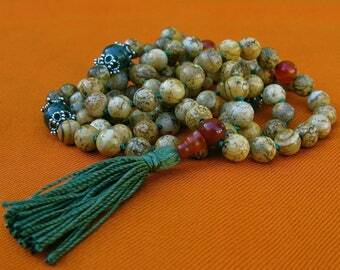 I love to make malas - Buddhist and Hindu prayer beads. I'm detail-oriented, with a love for color and texture. I use the highest quality of beads that I can find. 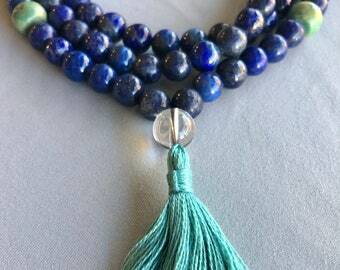 Mala making is an art form and a meditative practice for me. There's something about the intention behind making sacred art, craft, and jewelry that resonates with me. Customer service is a big part of why I'm here. And of course, everything is strung with love and prayer. Thanks, Etsy, for the nice mention in this article! I love to make malas and jewelry. Combining colorful stones, woods, and metals in ways that inspire the spirit is very satisfying! I've been actively selling online since 2008 and have met the most interesting people. This small caster works closely with me to carefully produce the cast metal charms and jewelry that I design. I carve the waxes, he makes molds, casts the items, polishes, and antiques. It's a very collaborative process. Charms coming soon!